Sri Lanka’s world cup-winning captain Arjuna Ranatunga said that the spectator interest in school cricket has declined due to poor standard of cricket dished out at inter-school matches at present. Ranatunga, who has won the prestigious Observer Schoolboy Cricketer of the Year award twice in 1980 and 1982, said the standard of local school cricket has dropped drastically, making a negative impact on the national pool. He urged that the country’s cricket authorities must take immediate action to overcome the situation and improve the standard of local school cricket, which was once considered to best the best in the world with a well-organised structure. The former Sri Lanka captain turned Cabinet Minister said the disgusting club politics in cricket has prompted successive cricket administrators to give step motherly treatment to school cricket because of the fact that they could woo maximum of only two votes from the schools’ association. “It is sad to see the deteriorating standards of school cricket. Unfortunately, Cricket Board officials do not pay much attention on school cricket as the Sri Lanka School Cricket Association has only two votes at board elections. Instead, they spend millions of rupees on clubs and billions on grounds to woo votes. School cricket gets step motherly treatment because of the huge vote base enjoyed by the clubs,” said Ranatunga who now serves as the Minister of Ports and Shipping. Ranatunga, who captained Sri Lanka to 1996 World Cup triumph and made a lavish contribution to Sri Lanka cricket, said the cricket authorities have forgotten that the foundation to national pool is school cricket. “They seem to have a different agenda and are doing a big damage to school cricket, which is the cradle to the national team. Politically, the Government too must focus on sports and particularly on cricket which has brought international glory to our country over the years,” he said.. Commenting further on the poor spectator interest in school cricket at present, compared to his days as a schoolboy cricketer at Ananda College, the ‘Captain Cool” said that the poor standard in school cricket discourages spectators. “Spectators will always be there if the matches dish out high standards - be it cricket or any other sport for that matter. For example, Bradby Shield (rugby encounter between Royal and Trinity) remains a crowd-puller because of its high standard. Similarly, school cricket could regain the spectators it has lost if we could improve its standard,”he added. He also said that his main target in contesting the last elections of Sri Lanka Cricket (SLC) was to burden the responsibility in restricting school cricket. “I specifically told Nishantha’s group that I would not focus on international cricket but purely on school cricket and need a bigger budget to uplift its standard,” he pointed out. “During our time, future Sri Lanka stars could be identified from junior cricket level. Then when we played first X1 cricket, 10 to 15 out of the top 20 schoolboy cricketers were assured of their places in the national pool,” he said. 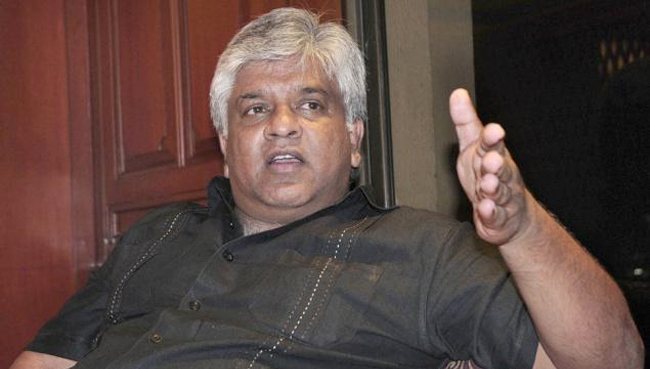 Ranatunga said it is altogether a different scenario now due to poor standards. “Even if a player has performed well at school level now, he will find it hard and is unable to absorb the pressure at club or national level. That is why we don’t see schoolboy cricketers stepping straight into the national team and cement their place as experienced during our era,” Ranatunga said. Ranatunga, who has aggregated 5,105 runs including four centuries and 38 fifties and captured 16 wickets in 93 Tests, said winning the Observer Schoolboy Cricketer of the Year or any other major award at the mega event is a life-time experience for any cricketer. “You may go places and win many other awards at higher levels subsequently, but an award won at Observer Schoolboy Cricketer of the Year event remains the most memorable in any cricketer’s life,” said Ranatunga. “Winning the Observer Schoolboy Cricketer of the Year award twice remains the most cherished moment in my life. That gave me tremendous inspiration and confidence when I stepped into the big league. When a schoolboy is adjudged the best batsman, best bowler, best all-rounder or the Schoolboy Cricketer of the Year, that’s a tremendous boost for that youngster, who could then aim at club level and international arena thereafter,” he added. Ranatunga, one of the most successful Sri Lanka captains and a great left-handed middle order batsman, said selection process of the Observer Schoolboy Cricketer awards could be strengthened further by obtaining the services of former stars. “I always admire the event and the awards I have won there. That is why I always try to make it to the event if I am in Sri Lanka when the show is being held. You could also obtain the services of a top cricketer of yesteryear such as Roshan Mahanama who does not have vested interests,” Ranatunga concluded. Ranatunga, still as a schoolboy cricketer at Ananda, was lucky to represent Sri Lanka at the country’s inaugural Test against England in 1982, only a year after winning his first Observer Schoolboy Cricketer of the Year title. He made it a memorable occasion by becoming the first Sri Lankan to score a half century (54) in Test cricket. He has proved his class in limited over cricket too, aggregating 7,456 runs in 269 ODIs, including four centuries and 49 fifties.